Skip this step if you already have a working WordPress installation. 1. Log on to your WP-admin interface. 2. Under Plugins in the admin menu, press Add new. 4. The H5P plugin will now be installed. Once the installation is completed successfully, click on Activate Plugin. 5. H5P should now appear in the list of installed plugins. 6. You should also see a link called H5P Content in the admin menu. 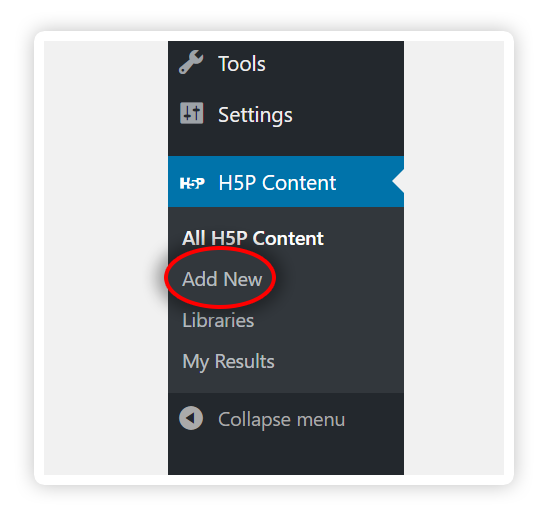 Now your plugin is set up and you can start creating H5P Content. After you click on "Add new" The H5P Hub will load - offering you a variety of content types to pick from. Below you can see how to get new content types from the H5P Hub. Here you can find Tutorials how to create content using different content types. Once you have created a content, you can add it to a page or post. Select the H5P you want to add to the post from the list that appears. A tag (e.g. [h5p id="1"]) will be included in the text field representing the H5P content. 1. 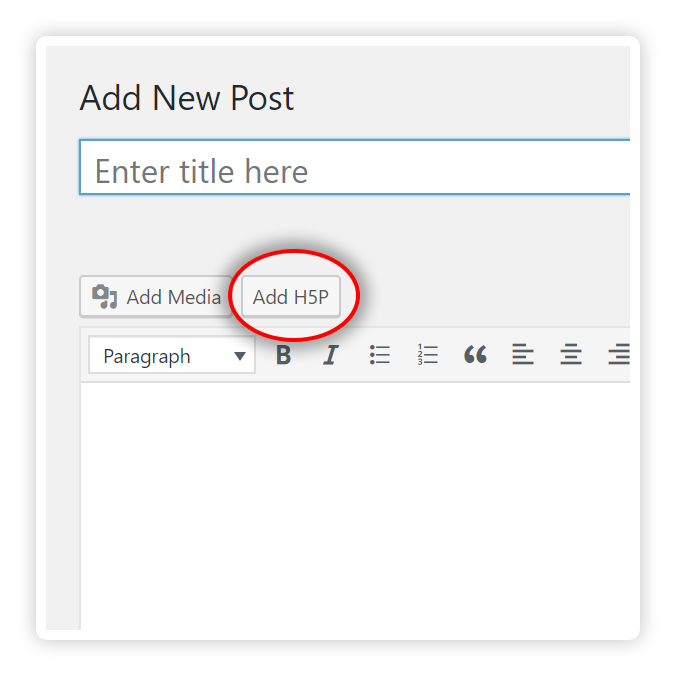 Visit H5P in the WordPress plugin directory. Download and extract the H5P package. 3. Navigate to your WordPress installation in your web browser and Login to the admin interface and activate the plugin. You can now start creating your own interactive content. An overview of special WordPress settings may be found on the WordPress Customization page. For more information about the H5P plugin for WordPress, check out the H5P page in the WordPress plugin directory. Is it possible to control the id number? No, not at the moment. Why do you want to do that? Is it a feature we should consider? i can't see the logs at My Results page. is it take a time? Logs should update instantly. Are you using WordPress or Drupal? WP. i can see logs from "All H5P Content". Thank you for awesome plugin. I just tried it with a multichoice and a drag text and once I press the check button in those my results are stored and shows up in My Results. Did you get the results in the "All H5P Content" section for your user, but not under "My results"? yeap, i can still see the logs at "All H5P Content" but not under "My results". i will implementation my thesis with use this plugin. is there any problem at future? Not sure what you mean with that last statement, but if you can give us access to your site using the contact form we will have a look and try to figure out why this problem occurs. Is it possible to resolve this problem somehow? hi, I had installed H5P into the wordpress , but when i test function , i clicked the create button , there were nothing in the drogbox. how to slove this problem? Hi, Now using wordpress is chinese and installing the library . but the droplist is english, if i want to turn the droplist into chinese , so which files should i code? You mean the names of the content types? I don't think it is possible to translate them yet :/ Will be fixed in a future update! thanks ，you answer my question. i also have one question, each time i uploaded the libraries, i found there are too many content type . when i deleted the content type from the librarie files, but the content type droplist still had the type which one i deleted.there is some problem in this right? i want to design some content types to show up. Also remember that when you design new content types you will have to increase the patch number in the semantics.json file for the latest version to be shown in your editor. Is there a way to size graphics so 1) they are still sharp when they go full page and 2) they still load quickly. Every picture I use will be set to be viewed as a full page and need to retain their quality. Your best bet is to use JPEGs (as I see you are doing). Find a size that fits your need. Andi in your photo editing program, you can often choose the quality to save the JPEG with. For photographs it's unproblematic to go down a bit on quality. It will still look the same. And your users can get very good load times. When I use the search bar in the plugins menu in wordpress to find H5P, it says there are no features that match my search. Any idea why I can't find it? I'm not sure which search bar you are using, are you on the /wp-admin/plugin-install.php page? That is strange, it looks as if the plugin isn't enabled / processing the text. Do you get any error messages in your web server's error_log file? Hi! This is really promising!I am creating a complex survey. This will be presented online to my clients. Most of the questions are simple, checkboxes or multiple choice except one. I am using WP Form for simple questions. Now in the exceptional question what i have to do is, I have 20 choices and i want my clients to categories these 20 choices into 5 categories (4 choices in each category). E.g 20 choices are say.....fruits----- (1) apple (2) mangoes (3) banana (4) guawa.....(20) raspberry etc.Now I will ask my clients to categories these 20 fruits into 5 categories:(5) I like them most (4) I just like them (3) I am not sure if i like them (2) I think i dont like them (1) I hate them. Now what i want is (1) No fruit is left uncategorised(2) Each fruit is categories only in one category(3) 4 fruits have to go to each category-no more -no less (so 5x4=20)(4) Each fruit gets the marks equal to its category . e.g suppose you fill banana as "I like them most" so banana gets 5 marks . If you categories Apple as "I am not sure if i like them" then Apple get 3 marks. (5) Ideally i wud want that this exception question is asked in continuation to my rest of the WPForm and that when i see the data filled by my client under Entries in my Dashboard, i get the data for these Apples/Mangoes etc.also in the same CSV file.-automatically. (whats the prupose of marks for each choice? Psychologically each fruit will represent some pref. for e.g Mango may represent luxury preference, Banana may represent health pref and so on......so ultimately...i sum total what marks fruits in each psychological category gets for my one client.....and that gives me a clue to his/her psychological profile. Someone may categories 3 fruits meant for health category as "i ilek them" and one fruit as "I am not sure if i liek them" so he gets 3X 5+3x1=18marks for health cat. He may categories 3 fruits for luxury as "I hate them" and 1 fruit for luxury as i just like them so he scores 3x1+1x4 =7 for luxury....so i can say he is predominantly health conscious etc....) This functionality is very very crucial for my project. I cant use simply ask my clients to give numebrs from 5 to 1 to these fruits because it may so happen that they may end up giving 5 to all of them, or 1 to all of them. The idea of Drag and ddrop is because of "Forced Choice". My clients are forced to prefer some over others. So though they may be hating all of them them but still i want to categories them...... Hope you can find some way for me. If a drag and drop functionality is not possible at all, then may be a distant second best would be where i am able to as them to Rank 20 choices from 1 to 20 ( no repetation of ranks- so if apple gets 1 then none else can now get 1). In this case I will take 1st 5 as belonging to "I like most" and last 5 as i hate them. This is not a very efficient method because, ranking 20 fruits at one go is little difficult and perplexing but Drag and Drop makes it fun. all my media on wordpress are uploaded to an external storage- azure storage to be precise. with h5p, they are uploaded to the web server which i don't prefer since i want to run a stateless server. is the way i can change this? i am also using learndash and i realize the interactive videos get uploaded on some occasions but sometimes they are never loaded. kindly help me make it more consistent for the users. It's not clear to me what the Learndash and Interactive Video issue is. What seems to be the issue? Any error messages in the logs? Hello, I have discovered that it is not a problem of the plugin, but of the server, I install it on another managed server and it works perfectly, on the own that I want it to work, it does not show me the bookstore searcher, and I charge it directly but it does not remove a "The file you uploaded is not a valid HTML5 package (Unable to unzip)". The question may be serious, what permissions does the folder require to load the libraries there and second in what folder would the libraries be stored if I would rather upload them by ftp? Unfortunately, you cannot upload them by FTP. You must use the H5P Hub to download or you can upload example content manually. From the error message, it looks like there's a problem uploading or downloading the file. Make sure your web server has write access to wp-content/uploads/h5p. Please correct me if I'm wrong, you are creating the content in Wordpress? If so may I know the version and the version of H5P? Hi, to create images within hotspots in Image Hotspot you need the H5P.Image library installed. You can check your library administration page to see if you have it installed already. If you don't have it you can download the Image Hotspot example at https://h5p.org/image-hotspots#example=63175 and upload it to your site to get the image library, or an equivalent example that has a dependency to the H5P.Image library. I have created a few different h5p things in wordpress. However, i don't get a preview when i click view. They don't appear when i add the shortcode to the page either. What have i done wrong? Please check for any other plugin that may be interferring with H5P. A good starting point are download optimizers. I've seen some that have interffered with H5P before and by simply disabling it for the specific page fixes the issue. Thanks BV52.. However, still no joy, no other plugins activated on the entire site. Even tried on a fresh domain. There may be something wrong with your server setup. Please see the "configure php" guide and make sure you have all the necessary extensions. Also check your php error log and browser console log for any errors when attempting to view the H5P, this should give some hints to what is going wrong with your installation. How do I go about editing the flashcards to include this library? I installed it and see it under libraries but its not clear how to use. Do I need to edit the code directly? Flashcards does not include a timer by default. To add a timer to flashcards you need access to a programmer and edit the code directly, yes. See for instance the documentation section on customizing and extending H5Ps, or post a compelling use-case for this in the feature request forum. perfect thanks! that is what I was looking for. I am new, and I'm very excited about using H5P! However, I was wondering if there is a way to randomize the content. For example, in flashcards, can you have the system shuffle them up before the student tries again? Or even use the content again later in another lesson as a 2nd embed and have the content shuffle to make the content appear in a different order than the 1st embed?